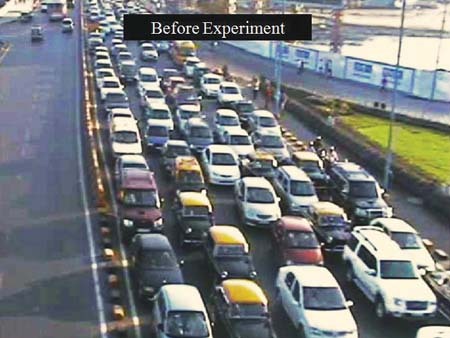 There is unanimity of opinion that traffic discipline is going down in all the cities of India over the years while the number of vehicles of all kinds ? moving as well as parked ? is growing in an exponential manner. One of the fastest growing industries in India during the last two decades is the automobile industry and it has contributed in no small measure to this unsustainable growth in traffic fostering indiscipline and unsafe practices. Our traffic accounting is based on the number of vehicles and not the number of passengers carried by roads, flyovers or freeways within the cities and this policy has led to increasing traffic jams, stressful, unsafe and time consuming commute. Transport in cities has largely become a real estate business. We are happily privatizing the use of public road space through hidden subsidies which contribute to increase the congestion. We have been tolerating a steady and relentless decline in the standards of traffic discipline. Our fines have remained unchanged for more than 40 years while the prices of ?space? have gone up. Making a few amendments in the Motor Vehicles Act and revising the fines structure in line with inflation can decidedly reverse the trend towards increasing indiscipline. Also, we don?t seem to think that with the use of IT, we can dramatically improve compliance and increase discipline, safety and smoother traffic flows leading to more space for bus systems and revenue which can be ploughed back into discipline infrastructure. London like many other cities has done this and achieved clear, positive and visible results. In 2003 London introduced a congestion charge of five pounds for entry into central London by a car during working hours on working days (but not buses). Subsequently the same was increased to eight pounds per entry. Today, the city collects ?1500cr from this charge annually and it is mandated that the same is exclusively used for the bus lanes. Up-gradation of bus infra structure and providing better amenities for bicycles and pedestrians are the only uses this congestion charge can be put to. Let us see the comparative congestion change figures of London and Mumbai (figures for London from the Economist dated October 19,2013). Parking revenue in London is ?300cr /pa (excluding all the multi storied private parking lots). In Mumbai , it is ?12cr and in other cities it is even lower. The amount of fine for traffic & parking violation has remained the same ? at ?100 per case (if caught) for the last 40 years. With low fines and very low chance of being caught, the incidences of indiscipline has grown tremendously. In Mumbai, the collection of parking fines, traffic fines and for drunken driving are respectively ?7cr, ?11cr and ?3.22cr for 2012. At the current level of traffic and parking violations, fines even at 50% compliance and increase of only three times in the amount of fine should lead to an increase in the collection of fine in the region of ?400cr. Since Lal Committee submitted a report containing several practical suggestions on traffic discipline and parking in the year 2000, we have done very little. Even BRTS on WEH or Jogeshwari ? 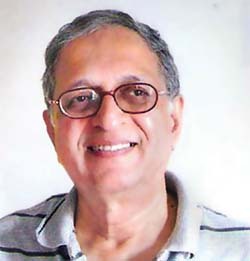 Vikhroli Link Road is in the discussion stage only from 2006. A recent visit to Seoul convinced the author that it is possible to achieve improved traffic discipline by observing and honouring the lanes and traffic lights leading to ?yellow junction box? for a few seconds in each signal cycle. In Seoul, this has helped the buses, moving in a bus lane, before and after a traffic junction. It should be coupled with stricter observance of parking regulations and a higher parking fees. How can we materially improve the traffic flows and calming on Western Express Highway? This is a major 26km long artery with typically 4+4 lanes. There are 13 flyovers occupying about 55% of road length which have 3+3 additional lanes above. All these flyovers have more than 18 traffic junctions underneath with huge volumes of traffic passing through even more than the traffic on the flyovers above. Use of flyovers by buses is quite meager as most of the passengers want to board or get off at the junctions under these flyovers. A BRTS is proposed for this artery for quite some time, but nothing seems to be happening. There is a bit of contradiction. If the buses use a dedicated centre lane on the flyovers to maintain high speed, they may lose on a lot of passengers as they are below at the junctions where they want to board or alight and need to go to the mid block between the flyovers to board or alight from a bus. From traffic counts on various parts of this artery during the last two years, we find that during the peak hours, this highway handles approx 3000 cars/taxies, 400 autos, 1200 two wheelers, 70 buses, 200 trucks and tempos totaling 4500 PCUs. The number of passengers range between 10,000 to 12,000. We need to measure the effects of congestion in slowing down the throughput during peak hours. We find that the 3+3 lane flyovers are supported by two columns between which there is space for at least two lanes (in reality three for cars/autos) which can segregate and carry the conflict creating right turning traffic. This will free up all the 3 – 4 lanes each on either side of a flyover to go straight or turn left. 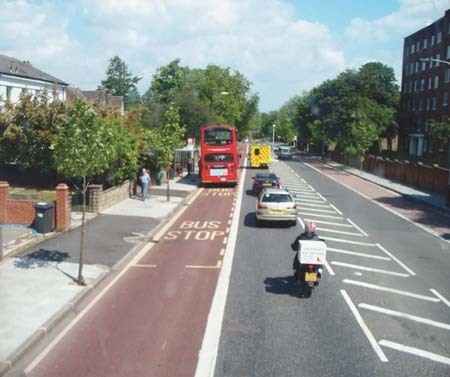 This design also permits reduced lengths for right turning traffic, hence reducing the conflict between right turning lanes from both sides as well as provide extra lanes for straight going traffic (in other words, can easily permit one lane exclusively for the buses going straight). Buses turning right can, of course, use the mixed lane which will now go between the columns. We are used to completely different behavior. Traffic police manually clear a lot of traffic in advance to occupy part of the junction box in anticipation of green lights. As a result, junction box is never empty. Vehicles in all directions keep on jostling and find a way in a cautious manner, sometimes brazenly too! We believe that this habit (although difficult) can be broken through a variety of simultaneous measures. 1. 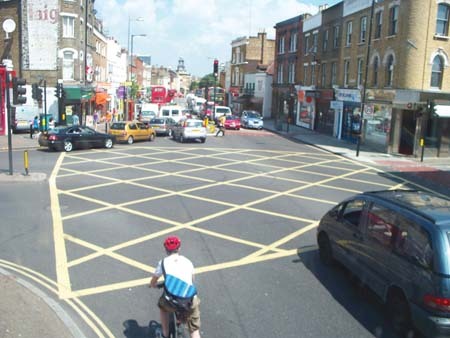 There should be bright and well lit markings on lanes, pedestrian crossings using colours. 2. Positions of traffic lights need to be very clearly visible to all the vehicles. 3. They should be supported by cameras which can capture numbers from the number plates of vehicles violating even the amber lights and those changing the lanes at the junction. 4. These number plates should be relayed electronically to central server which can issue electronic challans to the known mobile numbers, email ids instantly, followed by courier delivery based on known addresses. For this, there is a need to strengthen the database of not only new vehicles but also old vehicles. Alternatively, we should compel all the vehicles to have an RFID storing basic data. There can preferably be a prepaid amount from which the fine amount can be automatically deducted. This involves smart working between RTO and Traffic Police. The entire one time cost of hardware and software for this can be recovered very fast from the users. It has been proven that if all vehicles remain within the lanes and do not overtake in tight situation, the total throughput of all lanes goes up besides the fact that it improves safety, eliminates the need for honking and provides smoother and tension free ride. 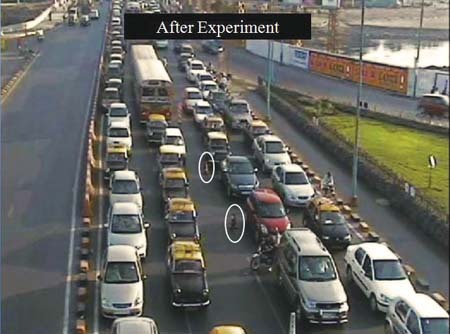 The Mahim experiment demonstrates this effect. But it has to be implemented in a comprehensive manner along with all the measures proposed under this project to get synergistic effect. Since western express highway is the widest in Mumbai and with very little parking and with service roads , it is possible to introduce the bus priority lane at the kerb in an effective manner with minimum time and expenditure as a pilot for the full feature centre lane BRTS. This can be particularly effective at the junctions which are the bottlenecks. A 200m bus lane before and after a traffic junction on WEH, can be possible especially if we take it up alongwith all the above measures. If we can bunch three to six buses within a signal cycle in one straight going lane at each junction, it is possible to achieve a substantial improvement in the speed and reliability of buses through the entire expressway spanning more than 15km and it will also set an example for making journey by buses very worthwhile. They can be supported by specially designed auto share stands on the service road next to a bus stop for the last mile connectivity. Parking can be shifted to slotted and paid parking in the service lanes. While we are confident that this whole exercise will offer a distinct improvement in the throughput of passengers and improve traffic calming in a significant manner, it is important that we test these hypotheses by using simulation software. This pilot project can be implemented without much cement & steel and disturbance to traffic within a year and would cost little in absolute as well as in terms of the positive effects it seeks to achieve. This proposal has been submitted to the Govt.of Maharashtra. Next: Interview:?The Barco solution is based on the fact that making the right decision is about seeing it. ?